A Flood Warning or Flood Watch generally refers to the flood potential of rivers and major streams. This can result from heavy rainfall or melting snow over a wide area, causing rivers to swell and inundate large areas. Downstream areas may flood well after the rainfall has ended or in areas where no rain occurred. Action Stage – River level is near bankfull, but below flood stage. At some locations there are pre-determined actions that must be taken, such as closing roads or increasing of staff levels for emergency workers. Flood Stage – The river is overflowing its banks and minor flooding begins in unprotected low-lying areas. Moderate Flood Stage – Flooding inundates some structures and roads near rivers and streams. Some locations require evacuation of people and/or transfer of property to higher elevations. Major Flood Stage – Flooding of developed areas results in extensive inundation of structures and roads and requires significant evacuations of people and/or transfer of property to higher elevations. The highest flood stage recorded at a gauge is called the flood of record. A flash flood is a sudden transformation of a small stream into a violent waterway after heavy rain and/or rapid snowmelt. Severe flash floods can tear out trees, destroy buildings and bridges, scour out new channels, and wash away cars. Life-threatening conditions can develop rapidly with little or no warning. Flash floods are the number one weather-related killer in the U.S. Nearly half of all flash-flood fatalities are auto related. 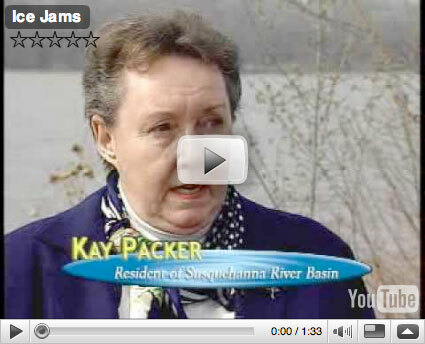 The Susquehanna Basin experiences several flash flood events every year. Areas with steep terrain are particularly vulnerable because gravity rapidly moves water into ditches and streams. Most flash floods are caused by heavy rainfall from thunderstorms or tropical storms. Other causes include dam or levee failure or the sudden release of water from the breakup of a debris or ice jam. Flash floods can develop within minutes or hours. You may not always receive a warning of these sudden and deadly floods. 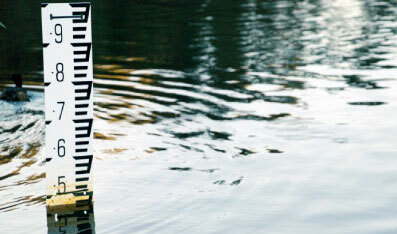 If you see rapidly rising water, seek high ground immediately. Urban flooding results when drainage systems in developed areas are inadequate to safely convey runoff. Localized flooding may result from blockage of storm drains or other drainage structures by debris. Urban flooding can develop rapidly, with water flowing down streets and ditches or backing up at culverts or storm drains. Basements can become death traps as they fill with water. Urban flooding may accompany other flood events or may be limited to developed areas, where runoff is conveyed by man-made systems. In urban areas, buildings and pavement limit the amount of water absorbed into the ground, resulting in significantly larger volumes of surface runoff that must be managed by storm sewer systems. When ice accumulates in a river or stream, it can interrupt the normal flow of water and cause flooding upstream from the jam. When an ice jam breaks up, the sudden release of water may cause flash flooding downstream. The 100-year flood is one that has a 1%, or one out of 100, chance of being equaled or exceeded in any given year. The term gives an estimate of the probability that a flood of a certain size will occur, not when it will occur. There is nothing to prevent a second 100-year flood from occurring a year or even a week after the first one. Regulation of floodplain development is generally based on the calculated 100-year flood, with development restrictions and standards applied within the area mapped as the 100-year floodplain. It should be noted that the lower areas within this floodplain will have a greater than 1% chance of flooding in a given year. Development and land use changes in a watershed can increase the amount and speed of surface runoff into streams and rivers, thus increasing the potential for severe flooding. In areas where significant development has occurred, the flood magnitude that was previously considered the 100-year flood may now occur more frequently.